Orrville Red Rider Sports Blog: Thoughts after Week 2 - That was fun wasn't it? Almost 500 yards of total offense, a dominating defense, big plays, big hits....this game was very fun to watch. The only obvious "fix" is the penalties. Over 100 yards in penalties probably took at least 1 more score off the board. Can't be that sloppy again. I'm sure that will be a point of emphasis in practice this week. I know it's splitting hairs, and I'm not trying to rub anything in, but 2 of Triway's 3 scores came against our 2nd team defense. If they had 250 total team yards, it was just barely. When I stopped keeping track, Triway's "Air Titan" attack was 10 of 23 for 162 yards and 1 TD pass that came after Orrville's lead was 41-6. I said it immediately after the game...there is no team more fun to watch than Orrville when we have our swagger going. I think coming into the game with people saying Triway would win and maybe some lingering doubt by the Orrville faithful as to how talented this team was. Doubters motivate the Red Riders....exhibit A was last years playoff game against Genoa....exhibit B might have been the Triway game. 1. Kyle Lichti - Very obvious...but very deserved. 277 passing yards, 4 passing TD's and 62 rushing yards in his first varsity start. He reminded more than just me of another Red Rider QB who wore #10. It's much too early for the Hiller comparisons, but you can't help but see the same potential. 2. 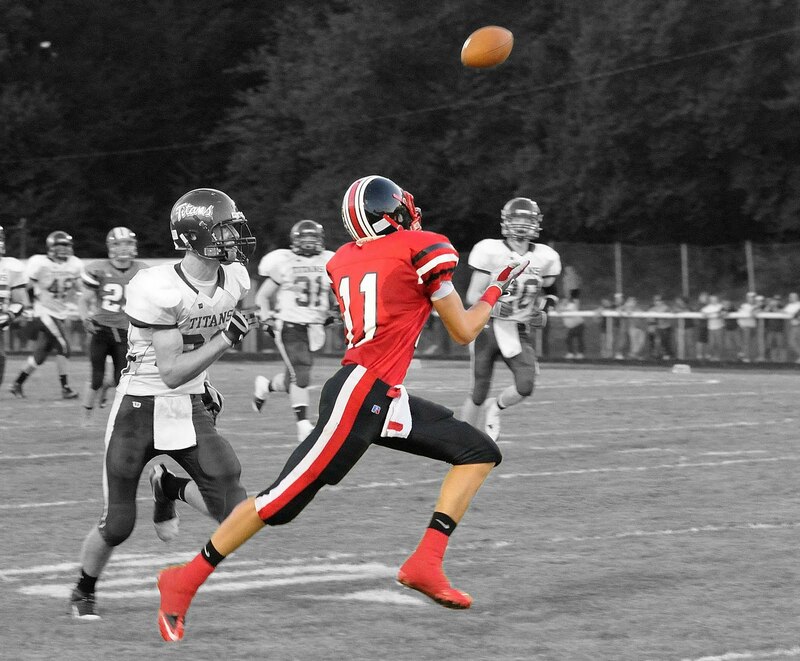 Drew Brenner - Kyle's favorite target, caught 4 passes for a career high 131 yards and 2 TD's. 3. Cody Rice - The other benefactor of Lichti's big night, caught 4 passes 84 yards and a score, and also forced a fumble on defense that really seemed to change the tide of the game. Cody established himself as a legit third receiving option. If Max can return to form on offense, he would make 4 scary receiving threats (along with Turner, Brenner and Rice). Add in Mason Monheim and Tre Simpson catching balls out of the backfield and we might have the makings of a very potent offense that can run and throw with equal efficiency. 4. Max Pirman - He showed his value in chasing Triway's Derek Carmichael all over the field and never letting Triway's passing attack get any kind of rhythm going. If there was a stat for "plays disrupted" Max would have had a number of those to go along with his tackles and sacks on the night. He's a game changer, and showed the Indiana University scouts in attendance what they have coming to them next season. Very proud of the Rider defense. Through two weeks, they've had nearly 75 pass attempts thrown against them, and save for a few breakdowns, have performed very well. Copley will be another team that likes to throw it around, but I think we'll see a legit run game for the first time against the Indians. I said the first team to 30 wins...I just thought it would be much closer. Thanks to The Daily Record for picking against us again....please keep doing it. Orrville loves proving doubters wrong. Of the 8 OCC schools, only Mansfield Madison lost this past week. Mansfield is a surprising 2-0, although the quality of their first 2 opponents leaves some lingering doubts. Ashland's big win over Dover cemented their status as the team to beat in the OCC. Wooster is 2-0 but still too early to tell on them as well. It is good seeing the conference rack up the out of conference wins. Another week, another stiff challenge...this time it's Copley. They're good and much improved over last season. I'm worried about a letdown. The guys will get plenty of kudos for beating Triway, but they need to stay focused and not give it back. Three wins to open the season will go a long way to securing another playoff berth. My Region 14 page is updated with scores from week 2. Two quality wins will really help us and wont back us into a corner like last year. Tough games loom at Copley and at Lexington....if we win both, we should be in the top 3 of the region heading into OCC play.